Mayo Sports provides custom screen printing and embroidery services for schools, businesses, teams, leagues and organizations. We are the premiere Minisink Valley sports apparel creator. At Mayo Sports, we’ve made it our mission to provide our customers with quality apparel and services. With more than 26 years of experience, we guarantee your satisfaction! Mayo Sports offers custom screen printing, embroidery, and personalization of apparel. Our design team is capable of bringing even the most complex ideas to life. Our friendly staff will help you with all your needs, and our excellent work is all completed in-house, meaning we can honestly say our work is nothing less than the best! Trust us with your business, and you won’t be disappointed! Lisanne and Frank Mayo are the owners of Mayo Sports, that has evolved over the past 26 years. In 1988, we took over a sporting goods store in our hometown of Saddle Brook, NJ, which went by the name of Brook Sports. We offered a full line of sporting goods and provided custom screen printing and embroidery services to many leagues, businesses, and organizations. When we decided to raise a family in the great community of Minisink Valley, we downsized and offered only our custom services to our customers. After 26 years we still provide our services to many of our loyal New Jersey customers, as many of our Minisink customers know we pride ourselves on offering only the best quality apparel and service. Our belief has always been to develop longstanding business relationships with our customers and our loyal repeat customers over the years have reinforced that belief. In 2013, with our three children grown up, we decided to open a storefront in Otisville, NY, and it quickly became the place for customers to buy Minisink Valley apparel, jackets, hats, bags, and more anytime they would like. 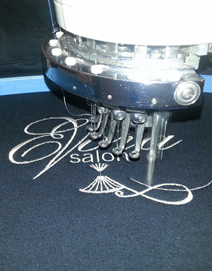 During this past year we have developed our custom screen printing and embroidery services and made many new customers. On September 2, 2014, we moved into our current location at School Side Plaza to better serve our customers with a location that was a little more convenient. The Minisink Valley School Complex is an integral part of our passionate sports community and we are conveniently located next door to better serve the families of Minisink and our surrounding towns. We would like to thank all of our wonderfully spirited people of Minisink Valley for your support throughout the years, and we look forward to many more years of supplying quality apparel and service to the local community. Quality Apparel and Service since 1988. We're Not Just Sports Apparel!